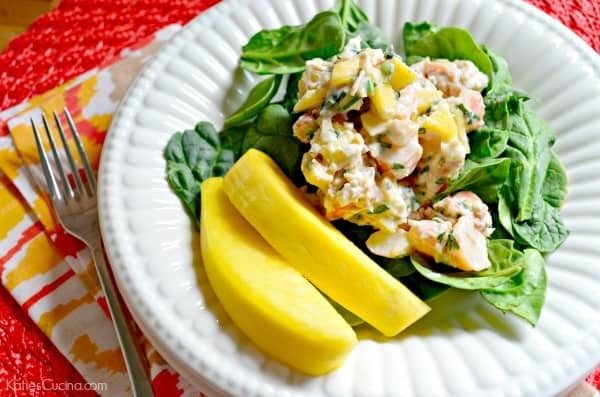 The weather is getting warmer, and in my case hot… What better way to cool off and enjoy a delicious light lunch than with a plate of tropical shrimp salad. I’ve made a tropical chicken salad before which I absolutely adored so I figured why not make a seafood version. I had leftover shrimp and didn’t want to eat it with cocktail sauce. This tropical shrimp salad was the next best thing. I had planned to serve it on a crusty French baguette. However, when I was about to serve it my mother in-law requested her scoop be on a plate of greens. I loved the idea and ate it just like that! This seriously is the perfect summer salad. Plump wild caught red shrimp with chunks of mango, toasted coconut and a light a refreshing sour cream sauce. The lime juice and zest will instantly make you feel like your in the tropics. Remember you can always serve this salad on a crusty baguette with greens. 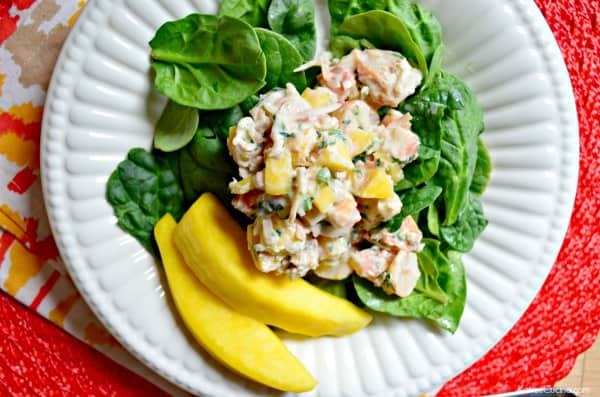 Or plate it just as pictured on a bed of fresh spinach and a few mango slices for “dessert”. 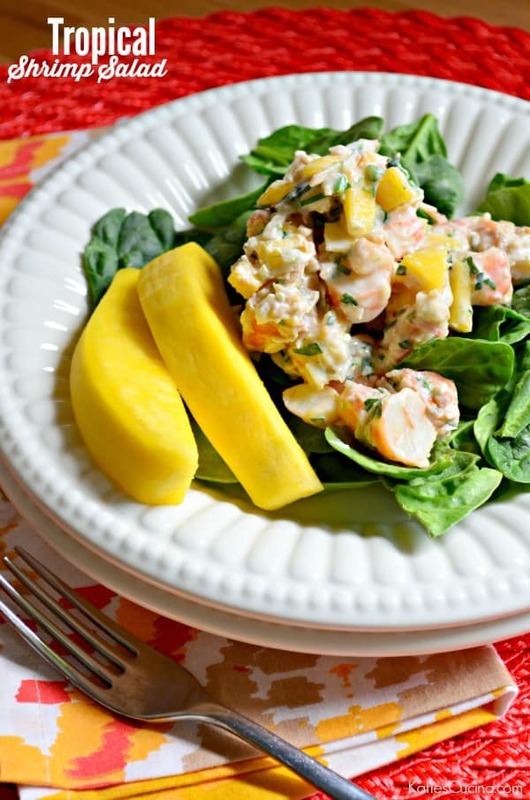 Whether your entertaining for a large crowd (you can easily double/triple/quadruple this recipe) or just want a quick lunch poolside my recipe for tropical shrimp salad will have you wanting seconds and thirds! Place shredded coconut in a small frying pan on high heat. Stir continuously until browned. Remove from heat and set to the side. In a bowl combine sour cream, brown sugar, lime juice and lime zest. Mix well. Then, dice the shrimp and mango. Add that to the bowl as well as the fresh parsley and chives. Lastly, add in the toasted coconut flakes. Mix well and let chill for 30 minutes. Serve on french bread.